little bee books, 9781499807035, 40pp. Inspiration struck when Momofuku Ando spotted the long lines for a simple bowl of ramen following World War II. 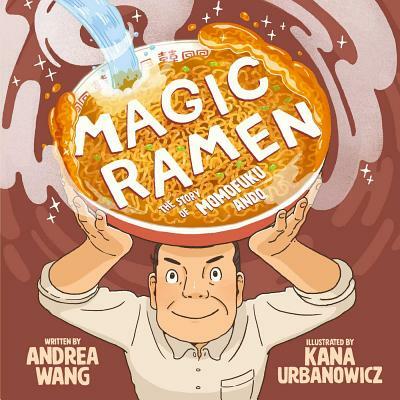 Magic Ramen tells the true story behind the creation of one of the world's most popular foods. Every day, Momofuku Ando would retire to his lab--a little shed in his backyard. For years, he'd dreamed about making a new kind of ramen noodle soup that was quick, convenient, and tasty for the hungry people he'd seen in line for a bowl on the black market following World War II. Peace follows from a full stomach, he believed. With persistence, creativity, and a little inspiration, Ando succeeded. This is the true story behind one of the world's most popular foods. Andrea Wang loves noodles, food, and noodling about food. A former environmental scientist, she appreciates Ando's scientific spirit, persistence in the face of failure, and passion for making the world a better place. Andrea lives in Colorado with her family and their dog, Mochi. Sometimes they have instant ramen for breakfast. You can find out more about Andrea at andreaywang.com. Kana Urbanowicz works mainly as an illustrator and likes to draw people eating delicious food. Apart from illustration, she also creates animations, comics, and even clay figurines. She lives in Kanagawa, Japan, with her artist husband. By a lucky coincidence, there is a Momofuku Ando museum nearby, so she went there for some inspiration and noodle fun. After reading Ando's biography, Kana is happy that she could take part in making this book happen! Read more about her works at tekumushi.com. An inspiring story of persistence and an ideal purchase for any collection. Eaters of all ages will enjoy learning about the history of this popular food gone global.